Each round is brass-cased, boxer-primed, non-corrosive, reloadable and loaded on a 10-round stripper clip. It is both economical and precision manufactured in the United States by an established U.S. cartridge producer. Received what was advertised. Will definitely be a returning costumer. Thanks. Fast shipping and Good quality ammo. Bought 2 Boxes of green tip. Will order more ammo. Thanks. Came packed ready for use in cardboard refills for bandoliers. Very clean, no misfeeds, and no misfires. Will definately buy more. Always fair business practice here. Always a good experience with these folks. I've burned through at least 1000 rounds. Never a FTF or FTE. Shoots sub-MOA through three different AR's Always goes BANG!!.. And so far always gives great performance. My best group was .75" at 100 yrds with a red dot and bench rest. Tactical "run and gun drills" gave me a 4-5" groups from 15 to 75 yrds off hand. Ran about 400 rounds of this through a couple different ARs. Did some pent ration test and this round pent rated 1/4" plate steel where the 62 grain enhanced penetrator core made splat marks on the plate with a small indention. I would choose this over the penetrator core any day. Easy to order, super fast shipping, and excellent quality. What more can you possibly ask for? Good quality ammo at an extremely low price. Fast shipping. Always a pleasure to do business with Luckygunner! Lucky Gunner as always provided great service: Fast delivery, Quality. This ammo works great in my custom built AR. Great clean ammo. No Problems in a brand new AR-15. Accurate loads. You folks did a great job buying this for your customers. Always amazed at the quick delivery. Ammo run clean, I usually run 62 grain but thought I would take a chance and run 55 grain which I've had problems with in the past! Tolerances have obviously been improved since my last use as I found balance of bullets to be crisp and to my rifles liking. Though I only used these at the 50 yard line at the range through a custom build AR-15 I built several months ago, I was pleasantly surprised how effective and true the rounds were. Also, I'm a stripper clip kind of guy so not having to load each round individually certainly made for an enjoyable morning at the range! Great ammo! great price. Used it on my M&P 15 works great 1/2" groups at 100 yards. 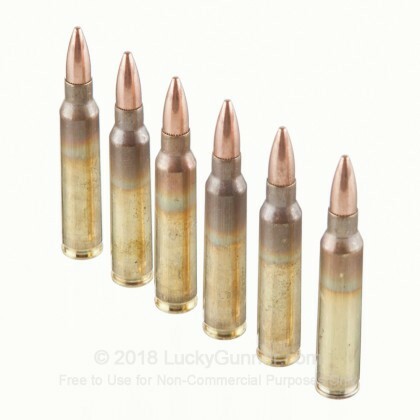 The ammo was great and the price was very fair. I was blown away from how fast my order reached my house. Will buy again for sure. No problems at all, just good ole shootin fun. Ross in customer service called to verify that it was indeed me that was ordering the ammunition since the delivery address was different than the billing address. Didn't want 420 rounds sitting by the door while I was out of town for someone else to take. I verified it was me and that I was sending it to my parents for safe keeping. Couple of days later, my parents informed me of the delivery. Dad was excited! Family shooting time! Awesome job! I have always had good results with Federal ammo. Shipment delivery was fast as always. I like the speedy delivery. Products are always as described and often the best price available. got here fast, no duds, smooth cycling, everything seems great. As always with ordering from Lucky Gunner the service is great and the shipping quick. 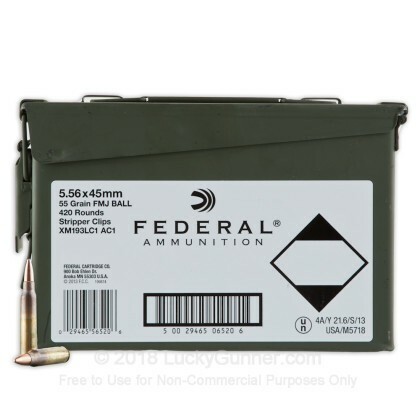 As always with Federal ammo- no problems with any be it the .22lrs', 223/556, or 40cal. Great ammo for the price!! LuckGunner shipped my order super fast like always and I recieved it in about 3 days! I did have a chance to try it out at the range and so far so good, not one FTE or FTF. Highly recommended it, I will order again for sure! great product ... good price .... reliable and honest people to deal with. What could be better. Thanks again. They don't go "click", they go "bang". The shots are consistent, at least good enough at 100 yards for my plinking. No problems at all with these cartridges. This was my first foray with stripper clips. Fortunately the box comes with a stripper clip guide. It definitely takes some practice to get right. Some magazines, especially plastic ones, don't like the guide, but it can still make for fast reloading of mags. Quick shipping, great quality and a good price. I will buy again in the future. Great prices and great service. The ammo arrived in 2 days in perfect condition. I also appreciate Lucky Gunner honoring the service of our veterans. This is a first class, reliable company. You can order with complete confidence. When my ammo supply runs low I will be back for more. Great work Lucky Gunner! Good ammo at a good price, fast shipping, would buy again. it is what it's suppposed to be. As always...great price, quality, and service! Thank You Luckygunner! The ammo worked excellent, shot in tight groups and for the money was a sweet deal. This is good, dependable ammo and Lucky Gunner is a consistently good supplier. After buying I did find another supplier with a slightly lower price, but I know that LG, overall, always comes through with fast service. Ammo arrived in 3 days. Fired 150 rounds thus far, no FTF's so far. Holds a tight group, and fires very clean. Very impressed with this entire transaction! Arrived quickly and as advertised. Ammo cans have a plastic seal on them and I only opened one for verification. Have not fired any of the rounds but all passes visual inspection. Excellant price and will be making several future purchases. I have been a satisfied customer for years now. Always a great product and at a really good price. I've discovered through trial and error, that Federal makes some of the "cleanest" ammunition around. It's gotten to the point that I look for their ammo to use in all my weapons, not just my Barrett REC 7 and Bushmaster AR's. So even though it's sometimes a little more expensive, this ammunition makes up for that by saving in cleaning time. I've never had an issue with either accuracy or FTF"s and that's a good thing! Ammo arrived quickly and in great condition. No failures. Very clean ammo as well. Great bargain. I will be shopping here again. This item was at my door 18 hours after placing the order online. All my other orders from LG have ALWAYS been at my house within 2 days, but this time is was here in 18 hours. The LG pricing is always competitive and this type of shipping support with keep me coming back, and back, and back, and back. Unless I am in a bind, I never plan on buying ammo from anywhere but LG from now on. I went to shoot my brand new IC SPR and it shot flawlessly. Not a single Jam. I couldn't tell you how clean it is since i have piston gun. Or how accurate it is with MOA because i don't shoot for competition. I shoot combat scenarios where your blood is running, so shooting a 1" group isn't what i aim for. But i can tell you with all that, that I could still hit small targets from a 100yards. So the bullet must be straight. I'll update when I shoot for precision. Q: Is the Ammo Canister Metal or plastic? 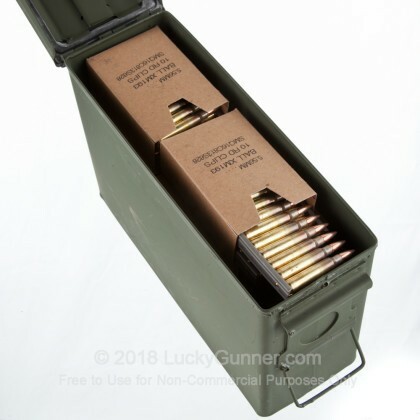 A: Hello Jack, This ammunition is packaged in a standard Mil-spec, metal ammo can. The can is a standard .30 cal ammo can. Q: does this set include the loading spoon? A: Hello Steve! The 420 round ammo cans from Federal do come with 1-2 stripper clip spoons in each can! 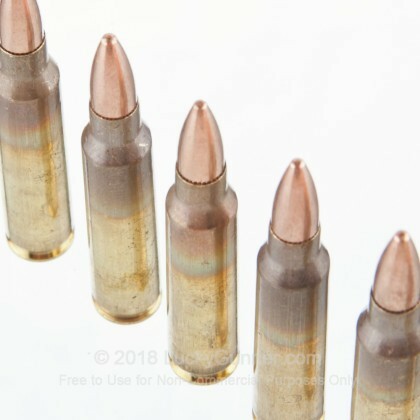 Q: Can you tell me if these bullets have a steel core? Thanks! A: Hello Rob, These 55gr. 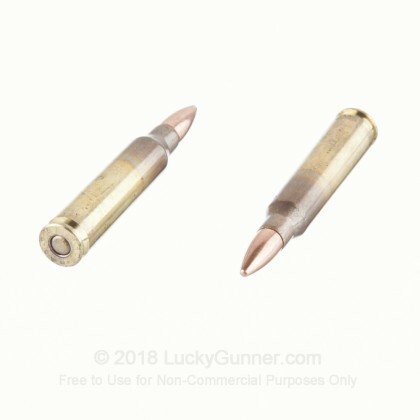 FMJ rounds by Federal in 5.56 have a lead core, copper jacket, and brass case. They are non-magnetic and are good for ranges that don't allow rounds that attract a magnet.